“ATHINA Study Abroad Program in Greece” gives university students an international perspective to their education. In ancient Greece, Athina was the goddess of wisdom, courage, inspiration, civilization, law and justice, mathematics, strength, war strategy, the arts, crafts, and skill. Athina was associated with the city of Athens because where she presided over her sisterhood there. She became the patron goddess of Athens after winning a contest against Poseidon by offering the olive tree to the Athenians. “ATHINA Study Abroad Program in Greece” takes place in Marousi, one of the most beautiful suburbs of Athens, and aims to introduce students to the Greek culture within the context of a lived experience. While a core course focusing in Greek history and culture will be offered, together with courses that link Greece with modern Europe, students will be able to take any regular university course upon agreement. All courses will be taught in English, but if demand is sufficient, a course in Elementary Greek will be offered. The program will run twice in 2017. Summer I term is starting on 20th May with the orientation weekend and teaching will commerce on Tuesday 23rd May. The term will finish on Friday 16th June 2017. Summer II term is starting on Saturday 17th June with the orientation weekend and teaching will commerce on Tuesday 20th June. The term will finish on Friday 14th July 2017. The application process will open on 10 December 2016 and any students joining the program by the 1 February will receive a 10% scholarship. Students with a GPA of 3.5 or better will be considered for a further scholarship. The application deadline is the 8th of April 2017. 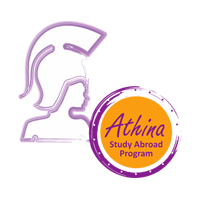 “ATHINA Study Abroad Program in Greece” is a joint venture between “Athina Educational Services” in Greece and “Kosmos Education Services Ltd” in the United Kingdom. We decided to bring together our long experience in Academia in order to provide the students with a unique international experience in Athens. Our view is that students must enjoy what they learn and the learning process of it. Therefore, we try to create interactive learning environments, though which students are engaged with the subject and we support them through the learning process.